Curiosity, creativity and bravery to be the first is the key to Alana’s success! A native of the Twin Cities Alana grew up in Hopkins, Minnesota exploring new and different areas than anyone in her family had ever done before. Being introduced to improv through her high school, Alana discovered her love for the arts and the magic of her ability to lead. Choosing Hamline University for college, she was able to serve in various roles as a student leader where she completed her Bachelors of Arts in Education and Public Health in 2015. 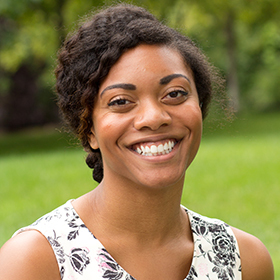 Knowing she wanted to continue to serve her community, Alana worked as an AmeriCorps volunteer for College Possible as a high school coach in Omaha before coming to Project Success Fall 2016. These experiences have given her the tools and hope to commit her life to the world of education through her community and youth. In her free time you can find Alana spending time outdoors, seeking an opportunity to dance or surrounded by the company of friends and family. Alana is thrilled to be part of Project Success and looking forward to the journey ahead! Safe at Home – Mixed Blood Theater, Spring 2016. I was able to attend this theater experience with Project SUCCESS and my impression of the show prior to seeing the performance blew me out of the water! This performance was the first time I had witnessed theater as something alive and moving as the audience traveled throughout the CHS Field to different scenes to experience the performance. I now have a deeper appreciation and love for the creativity theater holds. Many of my dearest friends live in different cities across the country or world. Whenever we have the opportunity to get together, I leave our time with a soul that has been nourished and energized. My ultimate vacation would be any place where I can escape with my best friends to experience a trip full of love and laughter to add to our memoir of friendship.